A one-of-a-kind performance, where each minute of one hour features a different composer and choreographer. The 60×60 Dance collaboration has been performed in more than 7 different cities in 3 different countries, featuring more than 500 choreographers and thousands of dancers. 60×60 Dance Toronto 2013 features all Canadian composers of every genre (from classical to spoken word and everything in between) and choreographers from every imaginable movement discipline (including mime, aerial dance, breakdancing, Kurdish Folk dancing, Flamenco, Ballet, circus, stiltwalking, modern dance, tap, and many more). Directed by the award-winning Viv Moore, Co-Curated and Produced by Tova Kardonne, and including pieces by Toronto glitterati such as the Kaejas, Andrea Nann, and Kevin Ormsby, this mind-expanding mix of concentrated, haiku-like musical and dance statements span the ridiculous and the sublime in one continuous hour of pure inspiration. 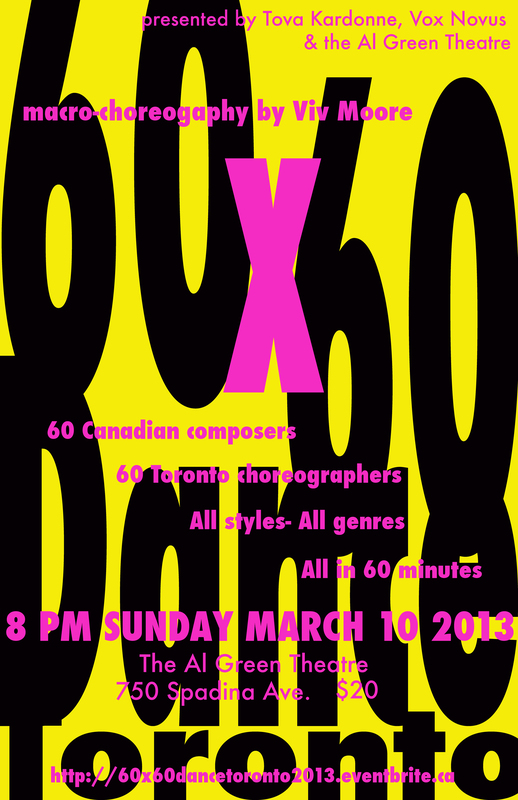 60×60 Dance was brought to Toronto by Tova and Viv in 2010, when Paula Citron called it “a thoroughly enjoyable and original hour.” She also gave 60×60 a “Genre Fusion Award” for her 2010 year in review for dance. The Thin Edge New Music Collective believes that contemporary music is a powerful medium which has the ability to comment and reflect on modern society in a unique and poignant way. We recognize that the broad range of musical idioms which new music encompasses functions as an important touchstone for contemporary life and as such are passionately dedicated to supporting our peers through commissions and performance. Ultimately we aspire to bring innovative and challenging 20th and 21st century music to audiences both existing and as yet untapped. 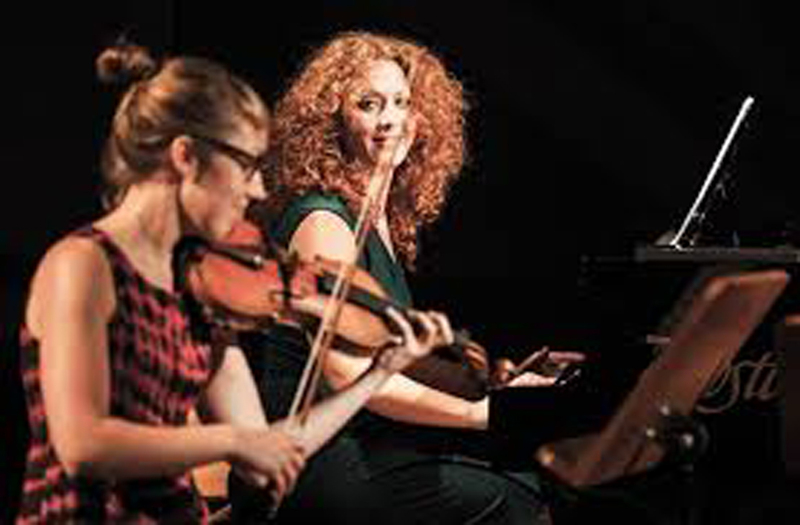 The Thin Edge New Music Collective (TENMC) was founded in 2011 by co-artistic directors, pianist Cheryl Duvall and violinist Ilana Waniuk. Since its inception, TENMC has grown to include 8 additional performers and has been responsible for commissioning and premiering 14 new compositions by emerging composers (including Kardonne’s Sonata Some Pubescent Notions of Group Dynamics) from Canada and abroad with 10 more in the works for their upcoming 2013/2014 season. 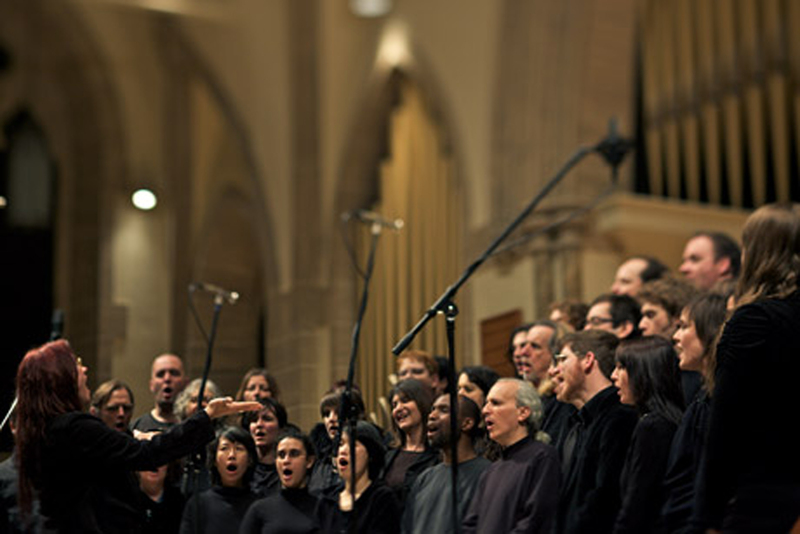 In addition to presenting a Toronto based concert series, TENMC has participated in residencies at the Banff centre and performed on concert stages across Canada including the University of Calgary’s Happening Festival of New Music and Media, as well as been presented by the Ottawa New Music Creators, Kitchener Waterloo Chamber Music Society, and Open Space Art Society in Victoria. In July 2013 Keys, Wind and Strings a touring concert project of TENMC was featured as ensemble in residence at the soundSCAPE festival of new music in Maccagno, Italy. In addition to “Some Pubescent Notions of Group Dynamics” (link above), Kardonne has been commissioned again to write for their upcoming Premieres concert May 8 2014, a larger series of works for chamber ensemble in association with the GREX vocal ensemble, entitled “macrowave”. a vocal octet that defies comfortable description. Led by Alex Samaras, their music features work by Meredith Monk, the hypnotic murmurings of Part, the contemporary Americana of Rorem, Schafer’s alliterative Gamelan and some steel-core Georgian singing. 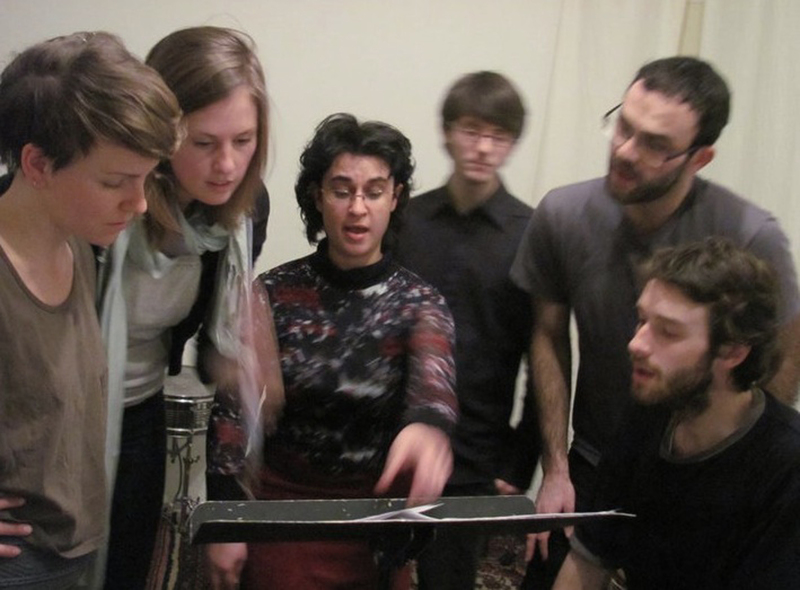 GREX will be performing their first commission by Tova Kardonne on December 21 2013 at the Music Gallery, “May,” as a part of the Music Gallery’s Post-Classical Series. The Element Choir draws singers from a broad spectrum of styles, from concert sopranos to singer songwriters to sound poets to Japanese folk singers, composers and musicians. Christine Duncan has developed, in collaboration with Jean Martin and DB Boyko, among others, quite language of sounds to draw from to create both structured and non-structured elements. 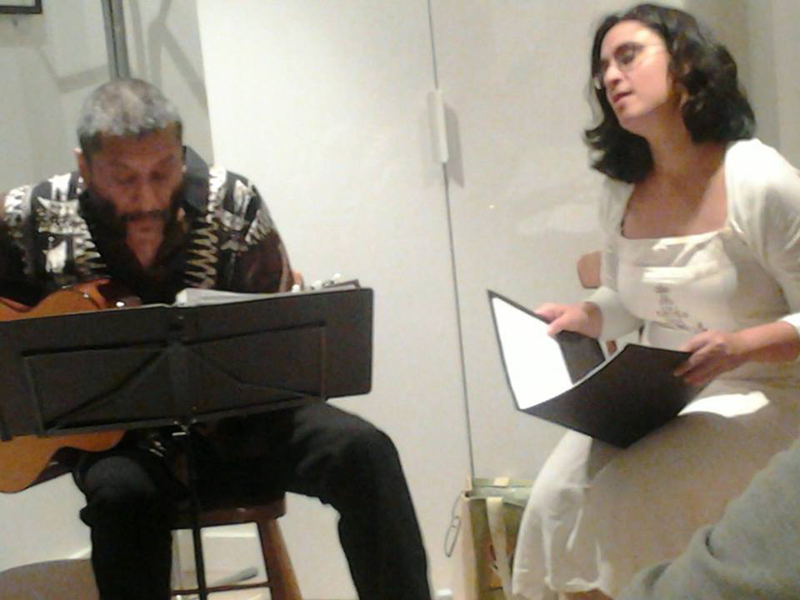 As an ensemble they explore textural and timbral sound qualities, soundscapes, rhythmic patterns, sound poetry, musical genre interplay and extended voice techniques. This cinematic approach to group vocalizing presents both tonal and non-tonal material in a constantly evolving and ‘in the moment’ sonic environment. Through various conduction cues and signals Christine has developed, she’s able to convey great emotion and drama through sound and vocal energy. Nilan Perera is a sonic explorer and improviser whose unusual approach to the guitar has earned him a reputation as one of Toronto’s most innovative experimentalists. In this collaboration, he and Tova Kardonne dig into the Brazilian vibe, playing Bossa Nova standards with twisty nods to their diverse and irrepressively original approaches. Where does the song end and improvisation begin? What’s the same and what will change? Challenging conventions and returning “jazz” to the jazz choir, Broulala, uses collective improvisation and variation as its guiding aesthetic, resulting in refreshing performances of standards within the vocal ensemble setting. Broulala features up to 7 a cappella voices and is led by Andrea Kuzmich, a PhD student in Ethnomusicology at York University. Drawing from different improvising and choral traditions, Kuzmich devised a method of arranging and charting that empowers the singers with choice. In almost every bar, each and every singer has choices to make – be it as simple as choosing one of two notes to sing or choosing a rhythmic pattern to perform, to more complex decisions in order to contribute to group improvised solos or soundscapes. Broulala literally composes parts of the song as it’s performed. Whether reinterpreting a jazz standard or exotic song styles from Central Eurasia (the region in which Kuzmich specializes) Broulala shows remarkable diversity and originality in performance. Improvising off of the groove, the singers realize a dynamic not often heard in jazz choirs. congratulations on a clean and quiet site…huzzah!! !